These filter pass a very narrow portion of FM band and attenuate all out-of-band carriers. See also CATV filters "Narrow Bandpass"
High quality FM band-pass filter - provides >30 dB out-of-band rejection +/- 10 MHz from bandedge, <1 dB insertion loss. Can be customized for 15 to 25 MHz bandwith, to pass from 80 to120 MHz. Ex: tuned to reject ch.6. CF7-FM (91-108). FM notch filters are available with five levels of selectivity. 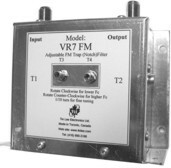 Designed to suppress one FM frequency and pass all other signals with low to minimal loss to adjacent carriers. The notches apply for user-specified FM frequencies (Fo). 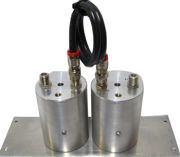 Custom Multiple notches to attenuate FM signals at specific frequencies. Custom FM channel combiner or divider. CMN7-FM consists of individual FM bandpass filters joined together at one common port. MT-50/75 (FM) is modified version of MT-50/75. 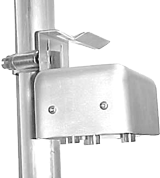 It is designed to impedance match 50 ohms FM antenna to 75 ohms receiving equipment. 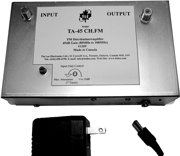 The MT-50/75-FM will optimize signal transfer, prevent impedance mismatch and reduce signal reflection. High quality FM antenna preamplifiers, designed to optimize FM signal reception from the TV antenna to the TV or Headend by providing a stronger signal with improved signal quality. High quality FM distribution amplifiers designed to optimize FM signal distribution, providing a stronger signal with improved signal quality.